What kind of gifts do you love to give? Families all have their traditions and ways of doing things at Christmas… including gifts. Some families carefully search out a special something for everyone, or pick names and have a spending limit, some have a themed gift exchange with specific stealing rules, other’s try to win the award for the ‘crying gift’ (giving the gift that is so touching, it makes the recipient cry)… the traditions are endless. No matter your tradition… its time to start thinking about it. 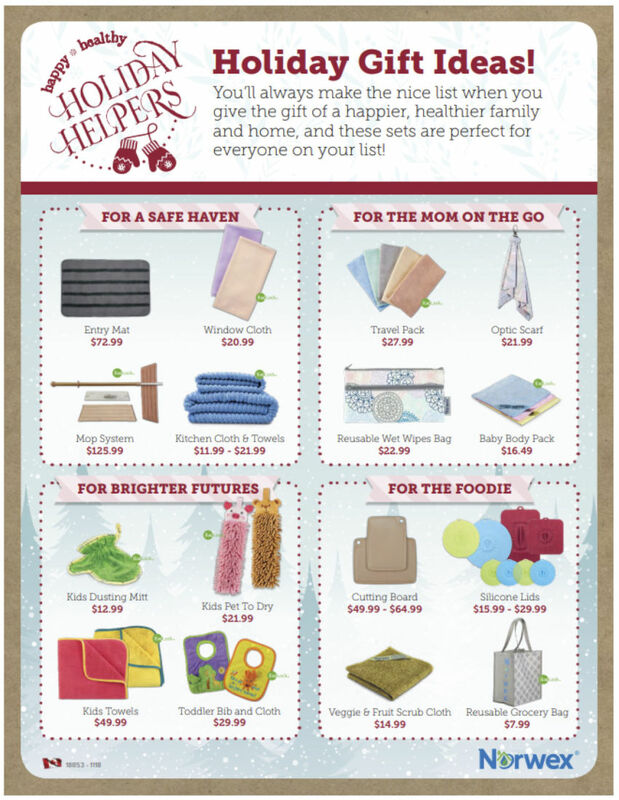 You may not have thought about Norwex when you were making your gift list… but Norwex products make a perfect gift. 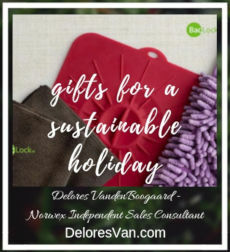 We all have stuff to take care of and clean… Norwex is in the business of offering superior products that help us take care of what we own in a way that preserves it lifespan and cares for the environment at the same time. Norwex also offers amazing personal care products that are gentle, effective and protective of our skin without any chemicals. Don’t those sound like things people should put on their Christmas list?! This package makes a perfect gift for those who love their vehicle. It includes a Car Cloth that is made of tightly woven microfiber that works with water to leave your vehicle streak free, shiny, without a scratch. The Car Vent Clips and Essential Oils are designed to replace artificial, chemical-laden car fresheners with natural essential oils. The Purifying Blend has a warm and inviting scent of spicy cinnamon, cloves, sweet orange, eucalyptus and a hint of rosemary. Just place a drop or two on the ceramic Car Vent Clip and enjoy. 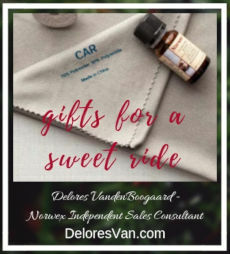 This gift will remove the need for chemicals car cleaners (that often get into our waterways) and chemical car fresheners (which get inhaled by the ones we love). Towels for Christmas??? Absolutely! 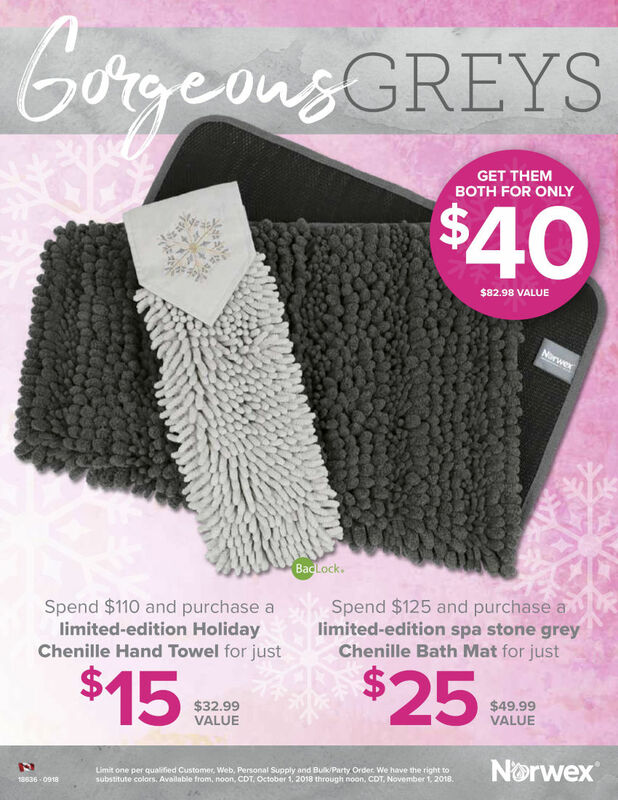 This beautiful Grey Chevron Towel Set is even better than the fluffy ones you get in the spa. They are thicker than the regular Norwex towels which means they are even softer and more absorbent (can you believe it?). 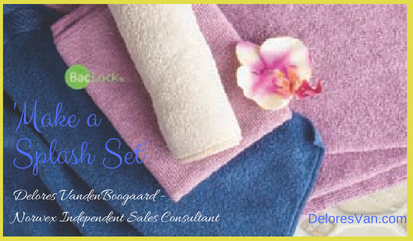 Norwex towels are made from microfiber containing the self-purifying properties of their Baclock™ agent. 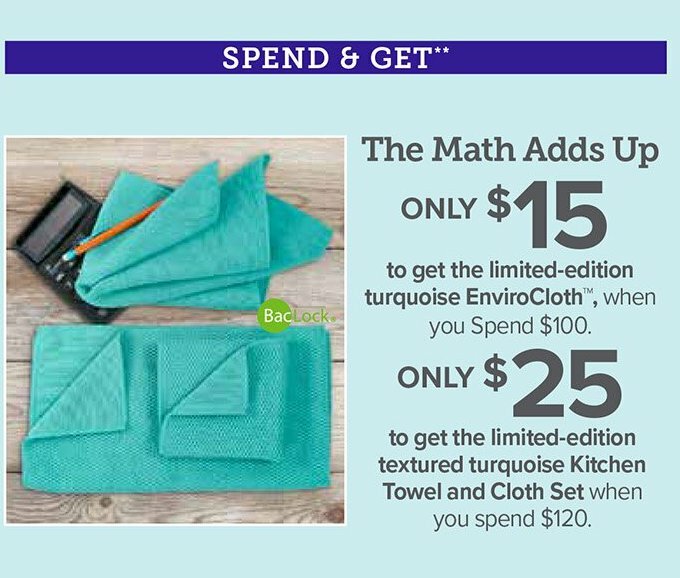 This allows you to launder them less often… doesn’t that sound like a luxurious gift? This gift set is perfect for those who are looking for environmentally-friendly solutions for their kitchen. The Square Bakeware Silicone Lid (9″ x 9″) is made of food-grade silicone and is perfect for covering baked goods (not only to keep them fresh, but also make them easily accessible 🙂 ). The Eggplant Chenille Hand Towel is perfect for those days spent baking or cooking Christmas dinner when you are constantly washing your hands. It is made of super-absorbent, nubby chenille microfiber and has Baclock™ agent to self-purify. The FREE Steel Grey EnviroCloth (Yup, free!) 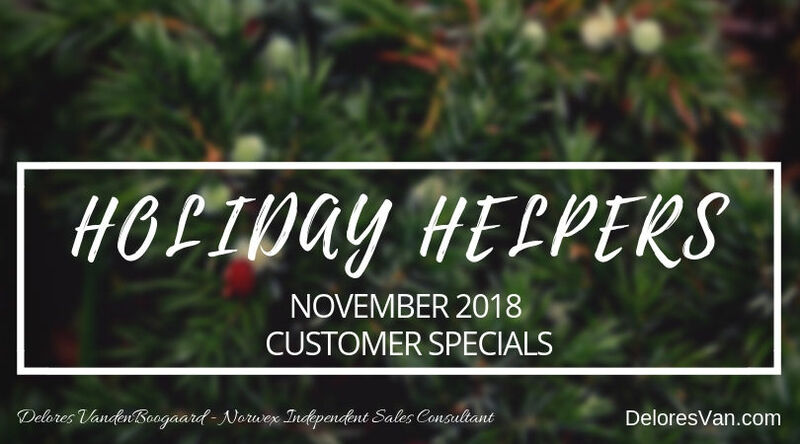 will beautifully maintain your counters as you prepare for Christmas, leaving them streak- and bacteria-free. Did you know that? Every piece of plastic every created, will be on this earth forever. 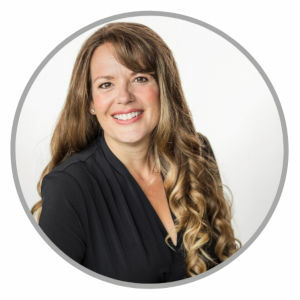 Mahatma Ghani said, “be the change that you wish to see in the world.” So with that in mind, I asked my team of consultants what their favourite Norwex product was and why. I was excited to see that the Bakeware Silicone Lids were one of the favourites… “Definitely the silicone lids (round and bakeware). They have cut down so much on our use of plastic wrap and tin foil” ~ Stephanie Jones. “My second favourite is the Silicone Lids. I don’t use tin foil when I bake anymore” ~ Shauna Wing. “Silicone lids and snack bags (no longer available). We use so much less plastic wrap and baggies!” ~ Nickey Heidebrecht. I love how making small changes in how we do life, can really impact the environment and our health! Christmas is a wonderful time of giving! But sometimes we forget that even the decisions we make at Christmas, even though our hearts are in the right place, do affect the environment and our health. This year, consider how you can bless those you love by considering how your gifts impact the health of the environment and health of your loved one. Has your family ever done a Green Christmas? Have you ever considered giving untraditional gifts that aren’t made of plastic and require batteries?? Have you ever thought about giving the gift of time or adventure instead of material things? Leave a comment about how your family celebrates the Holidays! 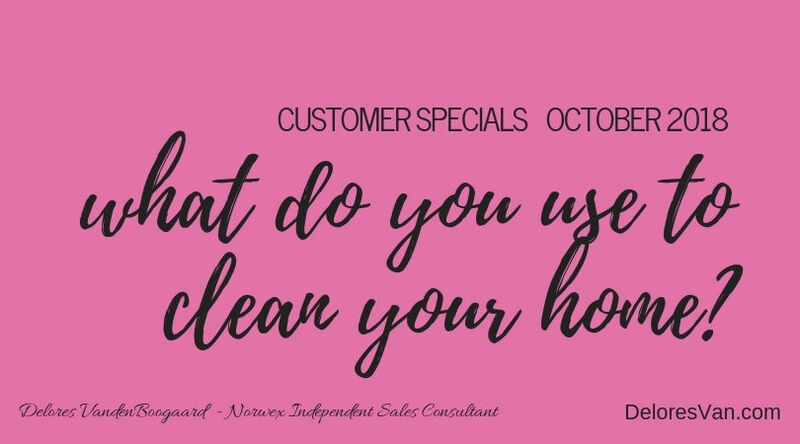 What Do You Use to Clean Your Home? I don’t think anyone really LOVES cleaning their bathroom… do they? But there is nothing like a sparkly clean bathroom (that moment before someone brushes their teeth and sprays the mirror or your favourite little boy needs to pee, again). I think we can all agree that a clean bathroom is a good bathroom. 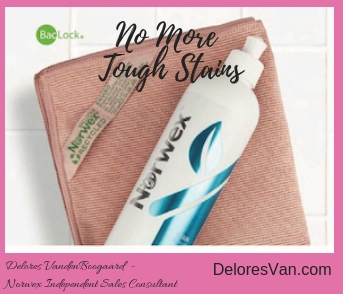 Keep reading to find out how you can clean your bathroom without chemical spray cleaners or VOCs … just a Norwex microfiber cloth and effective natural cleaners for those stubborn cleaning needs. 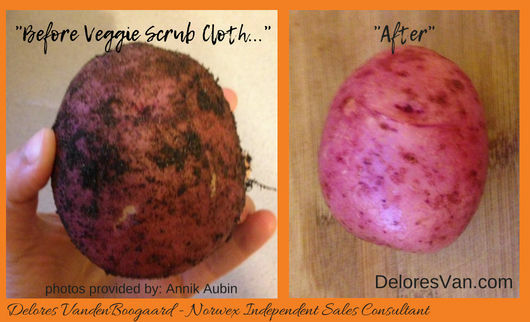 You will never use anything else after you try Norwex’s Bathroom Scrub Mitt coupled with Descaler. They make cleaning your bathroom so easy. 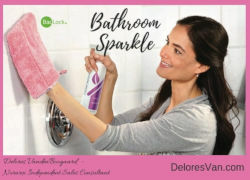 The Scrub Mitt is double-sided (a scrubby nylon side and a soft absorbent microfiber side)… the Descaler uses the power of natural Glucuronic Acid, Organic Orange Peel Extract and Sodium Gluconate to break down soap scum, hard water and rust stains in your bathroom and leave it “sparkling.” No chemical spray cleaner required. Norwex’s Stain Remover is another eco-friendly cleaner! It works to remove tough stains like coffee, tea, grass, makeup, lipstick, wine, fruit stains, mustard, protein stains from blood, greasy stains from butter and even removes yellow collar and under-arm stains. The best part is that it is free from phthalates, petroleum solvents, glycol ethers, bleach, ammonia, hydrochloric acids and it is easy to use (just spray the stain and let sit 1 to 5 minutes and launder as usual!) The Rose Quatrz EnviroCloth is a part of the new colour palette that Norwex released this year. The EnviroCloth is made from superior microfiber with Baclock™ self-purifying micro silver agent and can be used to clean all the hard surfaces in your home. It is these microfiber cloths that the Norway study is talking about, and for the record, a Norwex EnviroCloth and water has the ability to remove up to 99% of bacteria from a surface when following proper care and use instructions. Because of the this, you don’t need chemical cleaners. Tip: If you have a small stain in your carpet, make your EnviroCloth damp and then gently rub the spot… the cloth has amazing stain-removing abilities too! Have trouble getting your little ones to properly wash their hands? 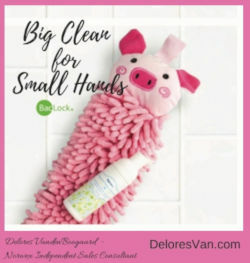 This cute Pet to Dry Pink Pig hand towel is a perfect encourager! It is made with super-soft chenille microfibers with Baclock™ agent. Not only does it feel nice on small hands, because of the Baclock™ agent, it self-purifies as it dries making it a great tool to control the bacteria that makes us sick. Your kids will love the Peppermint Foaming Hand Wash… it smells so good and who doesn’t love foamy soap? Did you know? Foam Soaps are better for the environment, because a little goes a long way. Wondering how Norwex’s soap foams even though it is chemical-free? The luxurious foaming action is due to the coconut and apple amino acids. Cool eh? Just one more special for October! I love the “spend and get”… I’m dutch, I love a good deal! 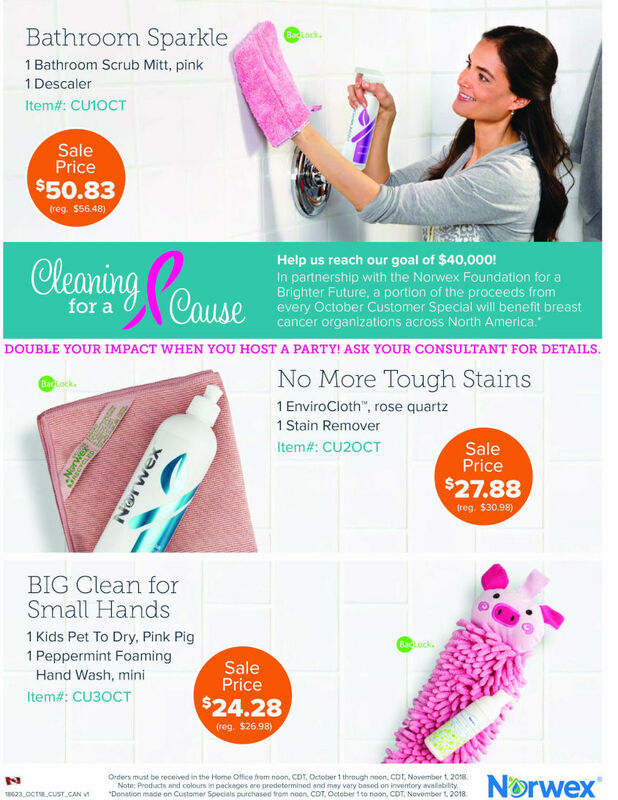 This month, the Norwex Foundation for a Brighter Future is Cleaning for a Cause and aiming to raise $40,000 for Breast Cancer Research. 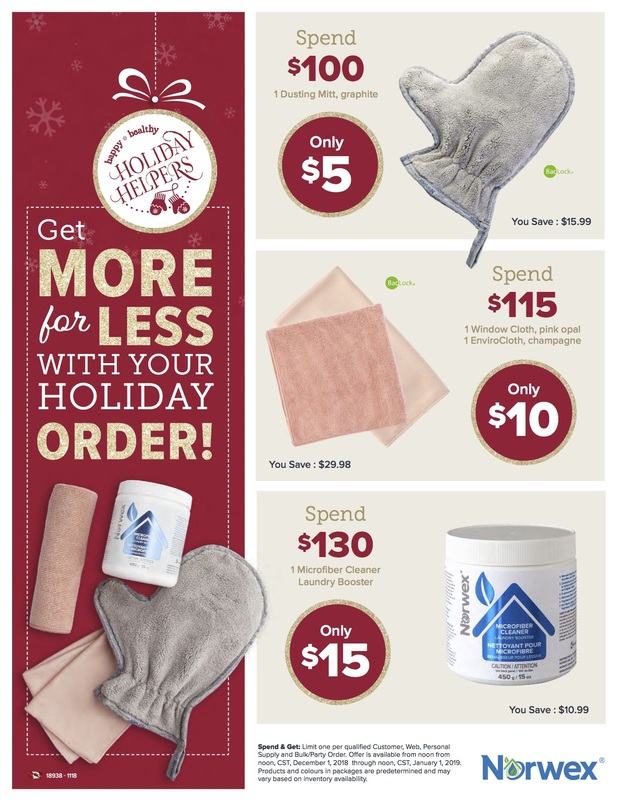 By taking advantage of the Customer Specials and even Hosting a Party this month, will not only help you clean your home without chemicals and VOCs, but you will also be helping the fight against cancer. Did you know? 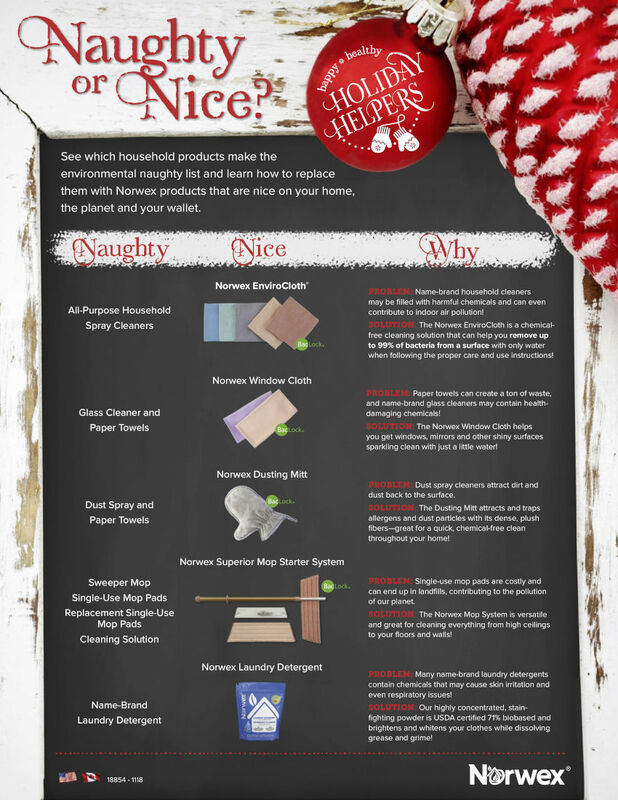 You can clean 90% of your home with a Norwex Microfiber Cloth and water. “Women who work as cleaners or regularly use cleaning sprays or other cleaning products at home appear to experience a greater decline in lung function over time than women who do not clean, according to new research published online in the American Thoracic Society’s American Journal of Respiratory and Critical Care Medicine. This study almost made me fall out of my chair! Did you know? “Of the 80,000 new chemicals that have been introduced in the last 50 years, approximately 200 have been assessed for their impact on human health.” I am glad that research is happening and that they are finding proof that chemicals harm us and that it is not necessary. To read some articles about this study… follow the links at the bottom of this post. This study supports that Norwex is a healthy and effective solution to our cleaning needs. Think of all the spray cleaners you use (or could use) to clean your home… dusting spray, all-purpose cleaners, floor cleaners, wood cleaners, window spray… the list goes on. But according to the study from Norway, it reveals that really there is no need for all purpose spray cleaners, artificial fragrances, dusting canisters, etc… just a Norwex microfiber cloth and water. Yeah Norwex! I love that Norwex offers a real solution to this problem. 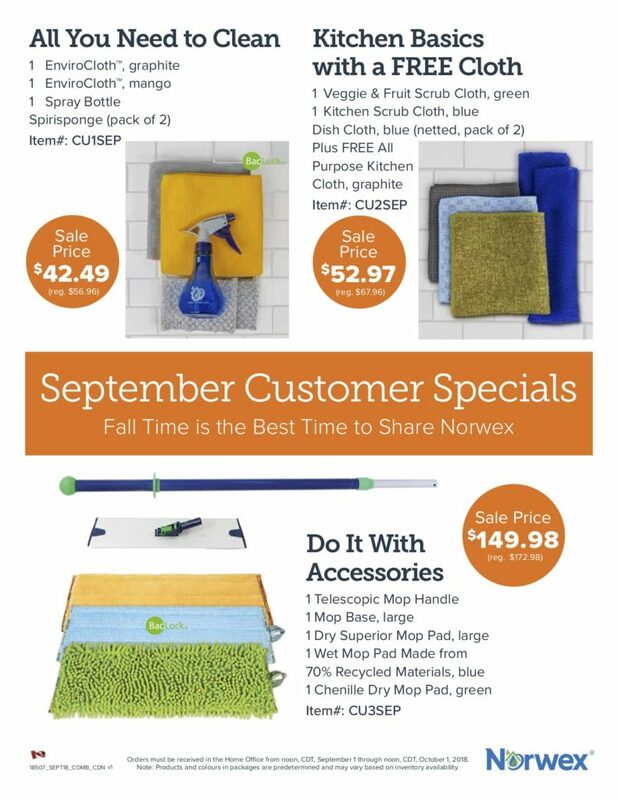 Check out Norwex’s September Customer Specials… You will be able to remove traditional cleaners in your home by simply replacing them with the featured Norwex products! Graphite & Mango EnviroCloth with Baclock™ – These are the Microfiber Cloths that were mentioned above. What makes Norwex microfiber cloths be able to clean up to 99% of bacteria from a surface when following the proper use and care instructions is how they are made. The microfibers are 1/200th the width of a human hair versus a dollar store microfiber cloths that only need to be 1/6th the width to be considered “microfiber”. The microfibers in one cloth can reach 3 million meters (from Winnipeg Canada to the Gulf of Mexico)…. that is a lot of absorbing material. They contain Baclock™ agent, Norwex’s micro silver antibacterial agent, that goes to work to self purify and inhibit odours from bacteria, mould and mildew in the cloth within 24 hours so that it is ready to use again. They make cleaning surfaces clean quick and easy … flat fold the the cloth and you will have 8 clean sides to clean with. 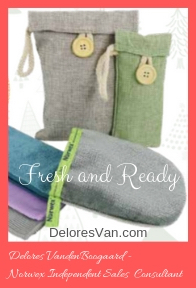 Best all-natural cleaning cloth around. Spray Bottle – An essential tool to use with your Norwex microfiber cloths. Make your EnviroCloth damp, start cleaning and when you feel you need a little moisture, use a quick spray and keep on cleaning. (If your EnviroCloth is too wet, it will leave streaks behind.) 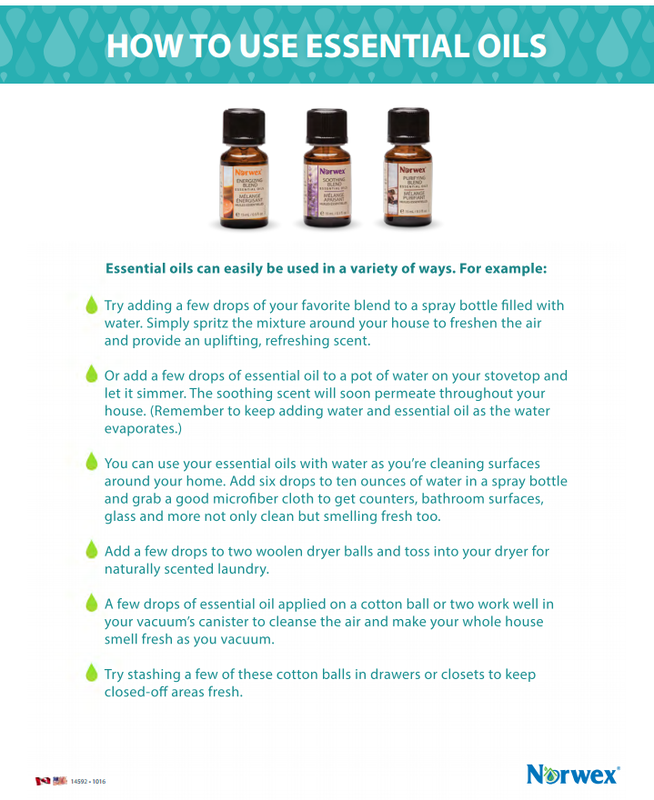 I also love adding a drop of essential oils to my spray bottle to add a beautiful scent in the air when I am cleaning. Try using the spray bottle when you mop your floor… it makes it so easy to add a little moisture to the floor and makes mopping quick! Spirisponge (pack of 2) – These sponges are pure eco-friendly scrubbing power that are safe for pots, pans, non-stick surfaces and glass-top stoves. I love that these sponges are safe in the kitchen for pots and pans and the like, but they are also designed to remove sticky substances like food or glue, they can remove rust and lime stains when coupled with Cleaning Paste, are awesome to clean your kitchen sink, and can even scrub your carrots and potatoes. Green Veggie and Fruit Scrub Cloth – The produce we buy in the stores have been subjected to a toxic treatment to protect it from pests and fungal attack. It often has a waxy or oily substance to prevent decay as well as preserve quality and appearance as it gets transported. Norwex’s cloth is two-sided; the scrubby side is designed to remove dirt, waxes and debris while the smooth side is for drying and polishing your produce. 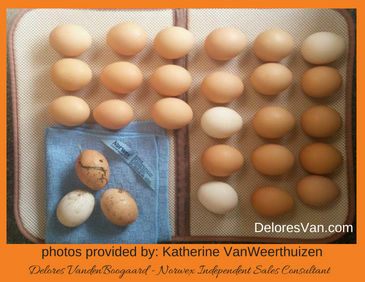 It is a great tool for harvest time… it quickly removes all the dirty from garden carrots and potatoes. Yum! Pack of 2 Netted Blue Dish Cloth – This nylon-netted dish cloth is made for those who hand wash their pots and pans (or maybe all your dishes). What makes it better than a traditional sponge is that it DOESN”T habour bacteria. Instead of absorbing bacteria and taking a long time to dry, the nylon dries quickly and the food particles and bacteria get rinsed through the holes in the cloth. It is scrubby enough to get your pots and pans clean, can be used with Dishsoap (unlike Norwex’s microfiber cloths), removes flour and other sticky food from the counter and washes out perfectly! Its a nice addition for your kitchen sink. FREE All-Purpose Kitchen Cloth – This is a great Kitchen Cloth that is versatile enough to be used with or without dish soap. The waffle-weave pattern creates an extra absorbent, extra durable, extra fast-drying cloth that is designed to be able to remove grease, caked-on dirt or anything your kitchen throws at you. Don’t you love how Norwex has a variety of cloths…enough variety that you can choose the perfect cloth for you. Plus, it comes FREE to try with the Kitchen Basics Special! How do your clean your floor? Is it really clean? What kind of cleaning residue is left behind on your floor? The Norwex Mop system only uses water to clean and has the ability to remove up to 99% of bacteria from a surface when following the proper care and use instructions. How can we protect what we love?… those beautiful bare toes, inquizitive sticky fingers and precious paws… by avoiding traditional floor chemical cleaners and using the Norwex Mop System. 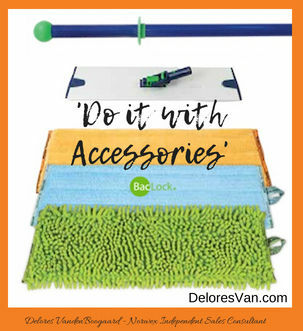 The only thing that is better than this mop system, is that it is on SALE this month!!! Use to dust your walls & baseboards. Norwex is a real solution to the problem that traditional cleaners cause. Most of us grew up with the smell of a clean home… caused by lemon-scented chemical cleaners… but these cleaners, as researched, compromise our health and our environment. 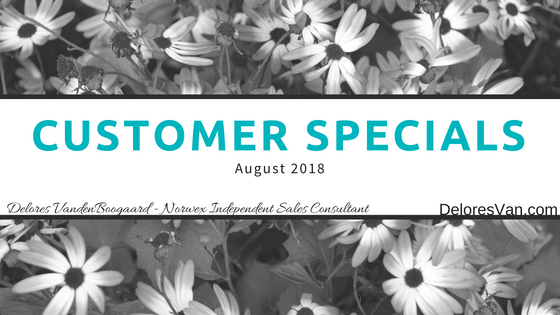 Try out one of Norwex’s Customer Specials… see how you like cleaning with Norwex microfiber cloths and water. 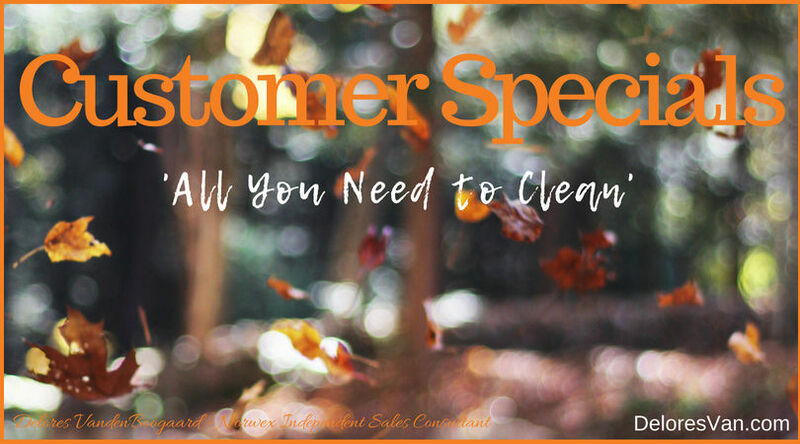 See how many cleaners you can do without! 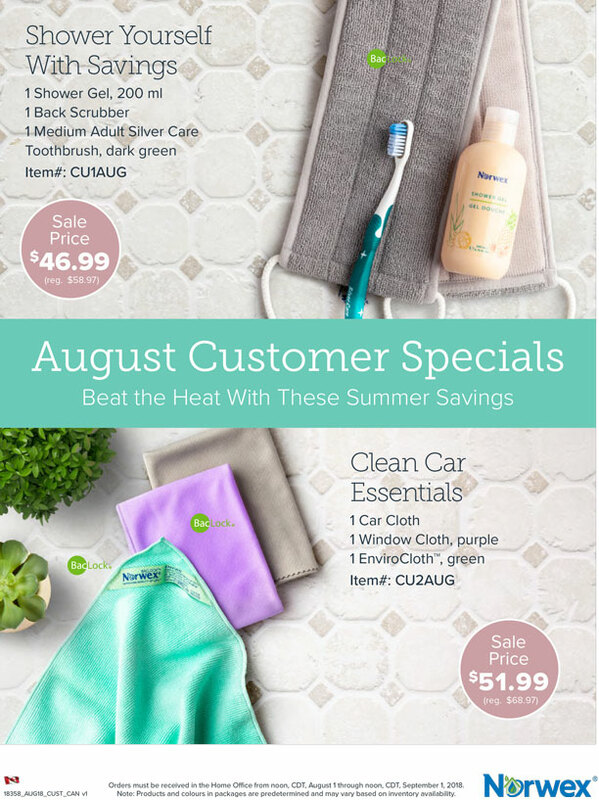 For the month of August, Norwex has some fabulous summer sales on products to maintain your skin and maintain your car’s finish. 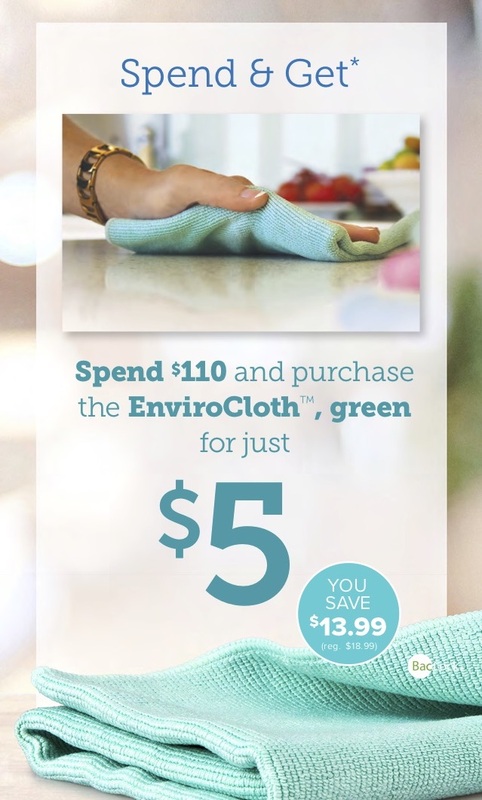 Norwex always has wonderful customer specials to help you make eco-friendly, all-natural choices about how you care for yourself and our world! The Back Scrubber is designed to exfoliate your ‘hard-to-reach’ back, neck, shoulders and feet and leave them deeply clean, radiant and feeling smoother. Exfoliation whisks away complexion-dulling dead skin and helps with hydration by revealing new skin that brings essential lipids and moisture to the skin’s topmost layer. This scrubber also has Baclock™… the microsilver agent in the cloth that helps self-purify the scrubber between showers. It is a “back saver”. 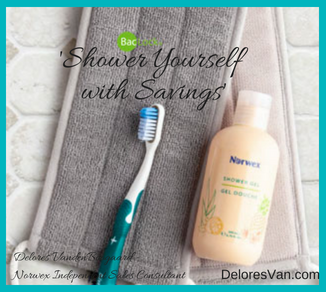 I love Norwex’s Shower Gel. It is the ‘cleanest’ product you will find and it has such a refreshing scent… derived from pineapple, coconut and lemon. I have customers who won’t use anything else… and it is perfect for the whole family and the environment. It is twice organic certified (BDIH & NaTrue) and can be used with your new Back Scrubber… Aaaah. The Norwex Silver Care Toothbrush is different than any other toothbrush you have ever used. Did you know? The same bacteria found on your toothbrush is the same bacteria that causes plaque, cavities, gingivitis and bad breath. When you rinse your Norwex toothbrush with water, the silver-covered base naturally releases active ions that eliminate 99% of bacteria commonly found on toothbrushes and provides a self-sanitizing process to reduce bacteria! After cleaning your teeth, rinse the brush thoroughly and it will be sanitized when the bristles have completely dried. Isn’t that AWESOME? They come in 4 different colours and replacement heads are available (should be replaced every 6 months). Tooth care is so important and I love that Norwex just made it better. Did you know? When you run your garden hose for just 10 minutes it uses 100 gallons of water! That is a lot of water! Plus all the chemicals/cleaners you use to clean your car go straight into the waterway through the drainage system without being processed at the water treatment plant. 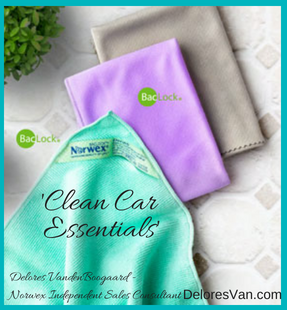 Having a clean car is wonderful… and Norwex has some great tools to clean it without harming you or your environment. 1. The EnviroCloth is my (& Norwex’s) favourite cloth! It is a constructed of 3 million meters of microfiber that removes dust, dirt, grease and debris from any hard surface (including the interior of your car). It is so amazing, that has the ability to remove up to 99% of bacteria from a surface when following the proper care and use instructions. Flat fold the cloth to get 8 cleaning sides to clean your whole car interior… with just water. 2. The Window Cloth will make your windows and your mirrors streak free. It is a tightly woven microfiber cloth, that only requires water and makes maintaining glass quick and easy. It will even remove all those little fingerprints off the kids’ windows. 3. The Car Cloth is another extremely-fine, tightly-woven microfiber cloth that is super absorbent and perfect for polishing your car. The microfiber is designed to absorb water but not dirt so that it won’t scratch your car’s finish. Also, because it leaves your car extra clean without any chemical muck left behind so you can expect your car to stay cleaner, longer. This car cleaning special reduces your need for chemicals and paper towel to keep your baby clean! Norwex has more great products for cleaning your car… read Car Wash… Norwex Style for more info. 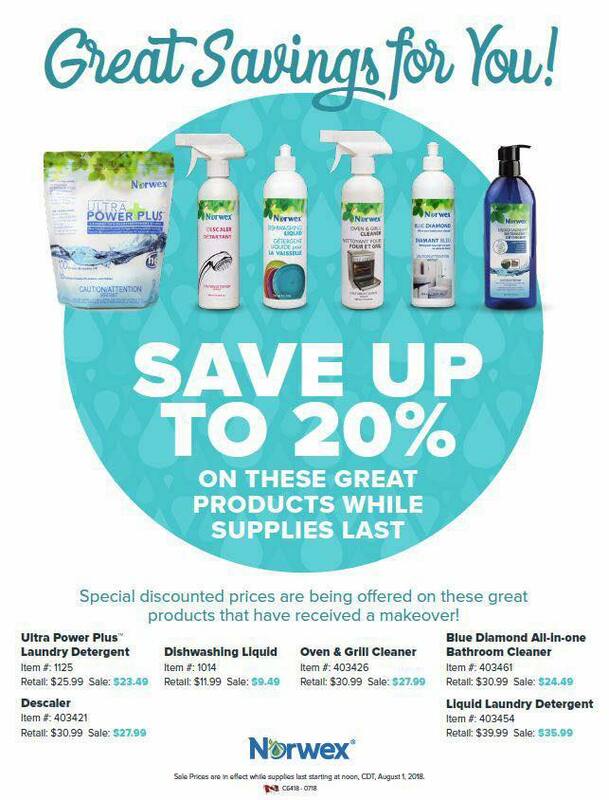 These customer specials will allow you to reduce your chemical use when you shower and when you wash your car. I love that Norwex provides fabulous solutions for day-to-day chores. Each time we choose an eco-friendly option we work towards protecting ourselves and our environment. 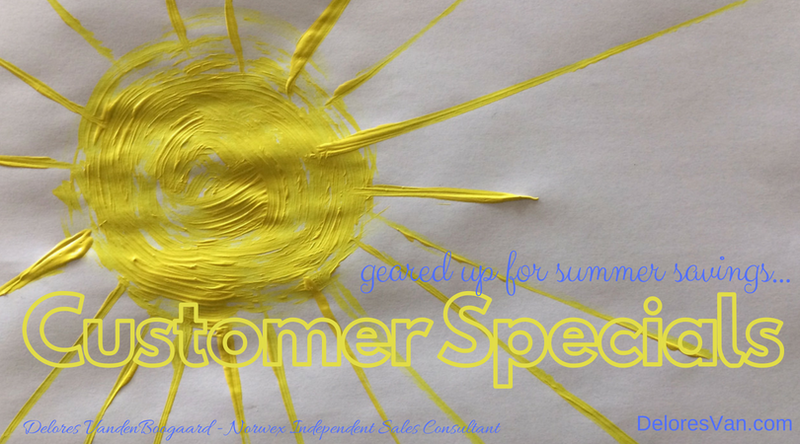 Enjoy these summer savings! Let me know how you been able to remove chemicals from your life! 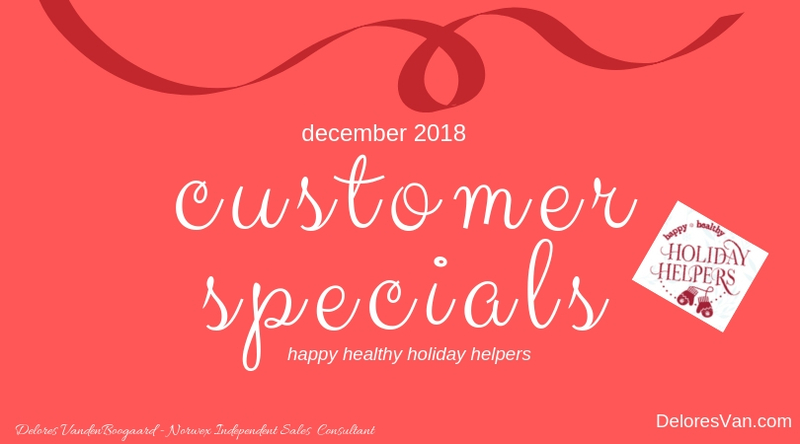 Norwex Customer Specials are the BEST! 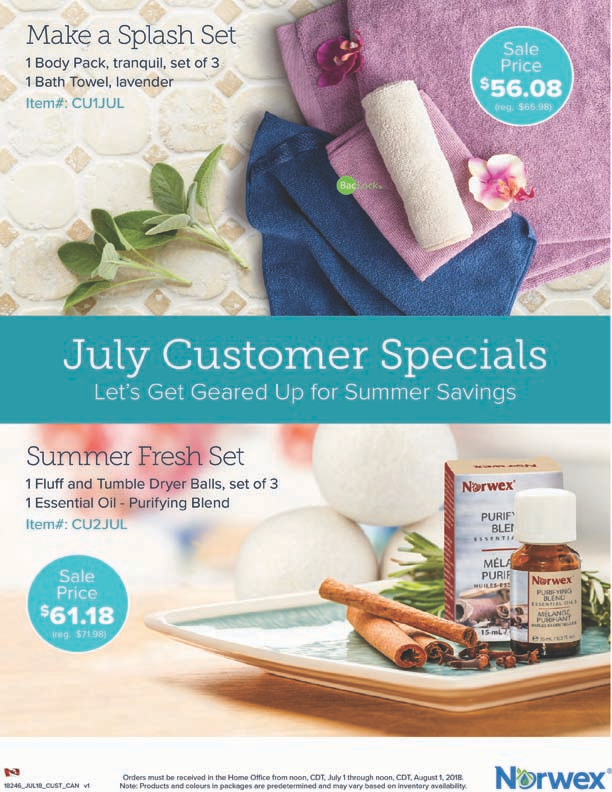 The July Norwex Customer specials include: Norwex Microfiber Towels, Essential Oils, and Dryer Balls! This month is all about your skin… instead of about cleaning. Summer months should be about relaxing, renewing and having some fun. Eco-friendly Norwex products will help you do this, while protecting your skin and your environment. Norwex’s claim to fame is their Superior Microfiber EnviroCloths. They clean with water, their fibers are 1/200th the size of a human hair and they self-purify with Baclock™ micro-silver agent. The Norwex Microfiber Towels and Body Pack cloths are the same… only softer. 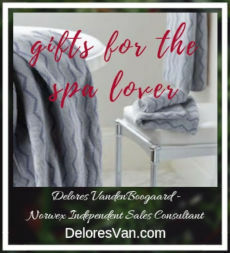 They are meant for cleaning your delicate skin (not the hard surfaces in your home), so they are made with super-gentle microfiber to pamper your skin as they cleanse. My family LOVES the Norwex Microfiber Bath Towels… these towels are not your regular towels! To dry your body, simply drape it over your back, then pat your legs and arms. Be gentle, the Norwex Microfiber Towels tender roll if you vigorously rub your body with them. What I LOVE about them… much LESS laundry! Everyone in my family has a Towel hanging in their closet, which they use for an entire week. They don’t smell, they are extremely absorbent, lightweight, quick-to-dry, and they are super-soft and fluffy. The Norwex Body Pack Cloths are designed to cleanse your face and body with just water. In fact, they are one of the very first Norwex Microfiber Products I tried. My sister actually introduced me and when I felt how soft they were and how they gently they exfoliated my skin with just water… PLUS removed all my makeup, I was hooked. There are the best Microfiber Body Cloths around! You might not think about how you wash your clothes and linens as being part of caring for your skin… but it is! Did you know? Fabric sheets and softeners are loaded with chemicals that are not only harmful to the environment – they are harmful to people as well. Some include benzyl acetate (linked to pancreatic cancer), benzyl alcohol (an upper respiratory tract irritant), ethanol (linked to central nervous system disorders) and chloroform (a neurotoxin and carcinogen) and more. * Our skin is our biggest organ, think about what you wrap it in. Thankfully, you don’t have to use fabric sheets or softeners because the Norwex Fluff and Tumble Balls are a GREAT alternative that are made of 100% wool. They reduce drying time, static cling and wrinkles… and can be used with a couple drops of Essential Oils to naturally scent your laundry. 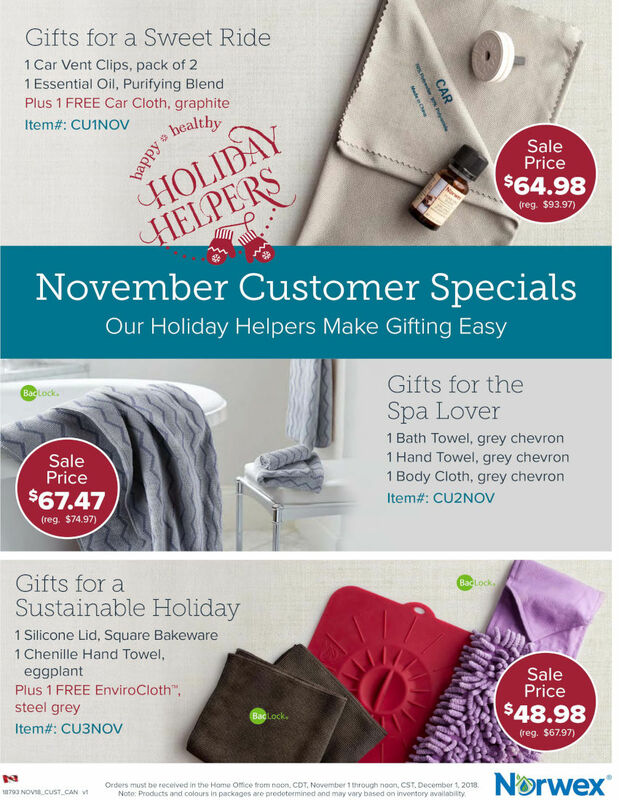 Norwex always has fabulous customer specials! They often include new and seasonal products… products to help you live green. 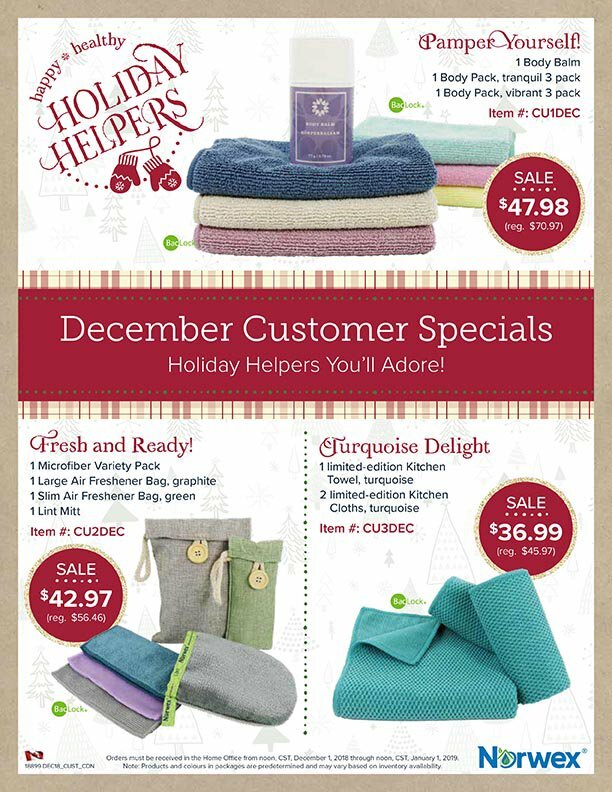 This month, the Norwex Microfiber cloths and towels are on special, as well as the beautiful Purifying Blend Essential Oil with Dryer Balls. 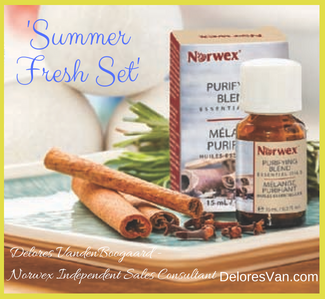 As summer is in full swing and beach days are hopefully in your future, stock up with these Norwex specials to help you enjoy the hot days. The specials change each month… so check back often. Let me know in the comments if you like the Body Pack Cloths as much as I do and what is your favourite way to use Essential Oils in your home! * “Greener” Laundry by the Load: Fabric Softener versus Dryer Sheets,Scientific American, December 10, 2008. http://www.scientificamerican.com.